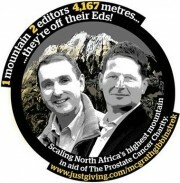 Jason Gibbins, editor of the Banbury Guardian, and Simon McGrath, editor of Camping and Caravanning magazine trekked for three days to the summit of Mount Toubkai in Morocco to raise money for the Prostate Cancer Charity. The two hoped to raise £2,500 for the charity after Simon’s dad was diagnosed with the illness but are on the way to doubling that with £4,283 raised so far. Mount Toubkal is part of the Atlas Mountain range and at 4,167 metres is more than three times the height of Scotland’s Ben Nevis. The two friends spent three days on the mountain, trekking for about eight hours a day in temperatures in excess of 80 degrees Fahrenheit and at high altitude.